As you may have guessed, I absolutely love combo-spins. 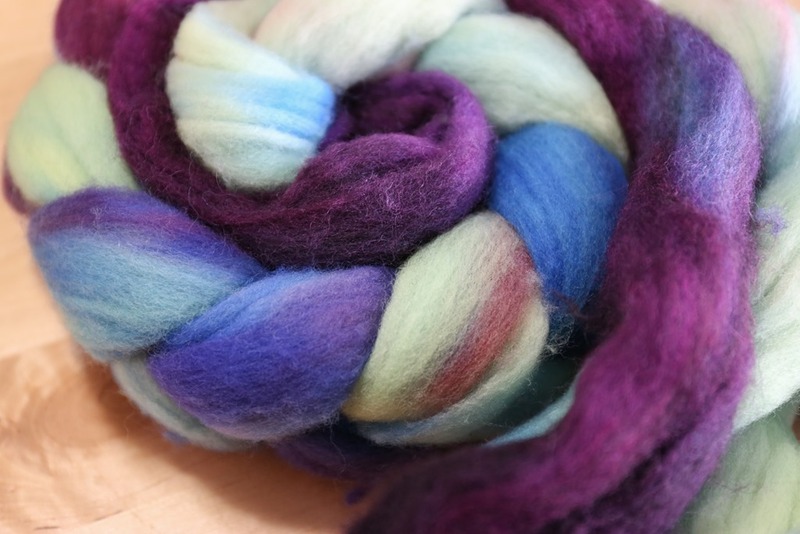 They are a wonderful way to shop from your stash and create new colours. These two braids have been in my stash for over a year and since Ancient Arts Yarns isn’t doing much dyeing on fibre anymore, I have been coveting the fibre. I kept coming back to the idea of combining to two for a number of reasons: The colours of each braid are included in both and side-by-side, they illuminate each other because they are complements (yellow-green’s complement is red-purple). The soft teal creates a more vibrant purple rather than muting one another. While barber-poling in a skein is far from my favourite thing, once the yarn is knit up, it can create an amazingly dynamic fabric. I achieved this with my recent Vanilla Shawl that I have worn an unbelievable amount. 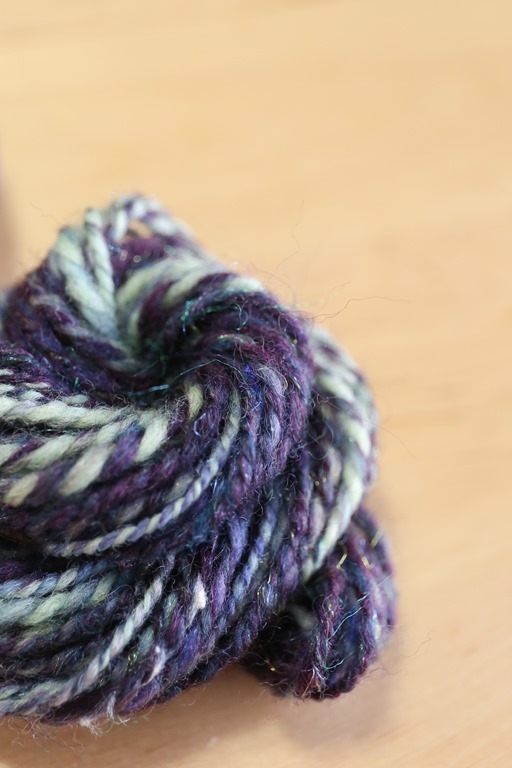 After I plied my recent combo spin that was inspired by Grace Shalom Hopkin’s Mason’s Medley, in which she combined roving with combed top, I just loved the light, airy yarn. Why not do that again? So I decided to card up the Purple. 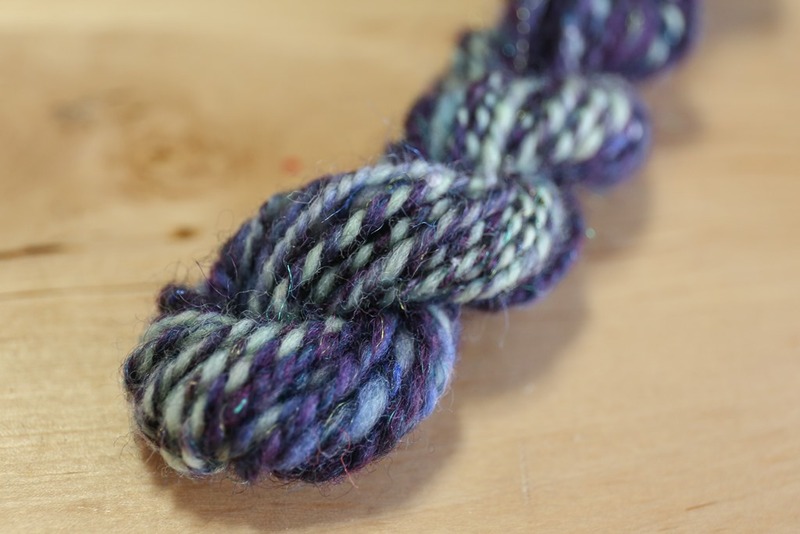 The sample yarn was light and airy, just as I’d hoped but there was more barber-poling than I had hoped. Overall, the yarn is really lovely. I enjoyed spinning this combo. Combination drafting definitely takes a lot of practice to keep it consistent because one ultimately always wants to take over in the drafting zone. 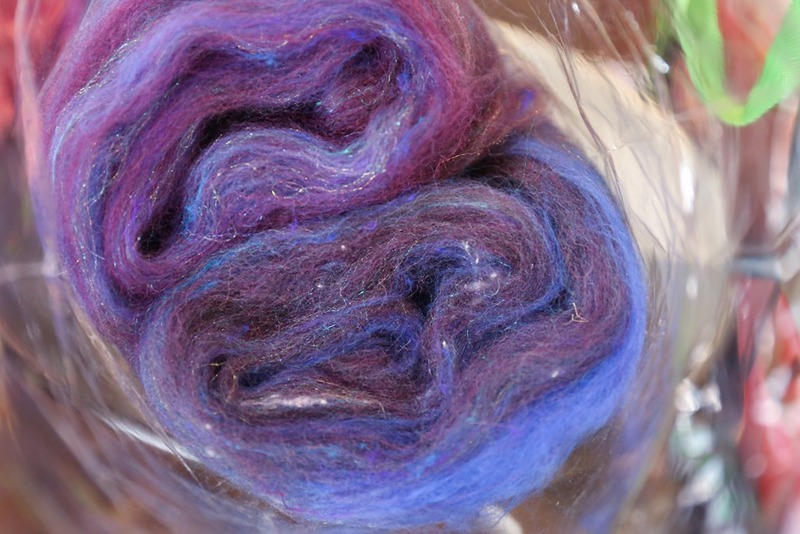 To create more harmony between the two braids, I added some royal blue to my batts of the purple Mixed BFL. 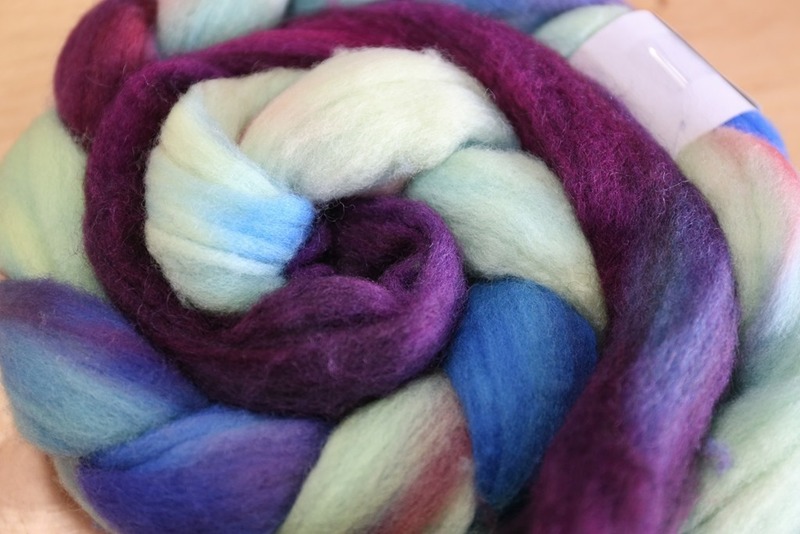 Before I commit to spinning more of this combination spin, I’m going to spin a larger sample and knit it up. I want to be sure about this particular combination before I commit to an 8-10 ounce spin! My initial sample was very barber-poled and high contrast. There were areas that I absolutely loved but overall, I wanted more harmony and depth. Adding the royal blue, I’m hoping, will help with that harmony. Here are the first two that I’m going to do a bit of sampling with before I continue on! Good luck! I’m anxious to see the results. I’ve not played much with color yet just different breeds at this point so I’m interested in what to do with braids. Thank you! Colour management is a whole other side of spinning, isn’t it?! Always learn so much from your blog. I love you Vanilla Shawl and who would guess the fiber was barber pole. Thank you, Carolyn! Yes, it’s amazing how yarn transforms when we knit with it! Is think it’s going to be beautiful. Royal blue is one of my favorite all-around colors and it really pops in that batt.